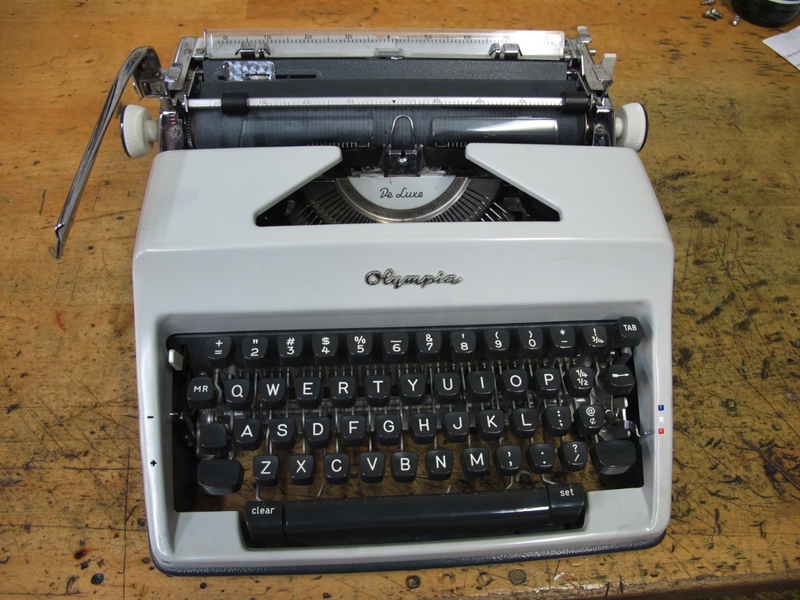 OLYMPIA SM 9 Wide Carriage… Currently at the Cambridge Typewriter Spa. Can’t wait to write some run-on sentences with this one. Actually the last of the SM 9s to arrive. 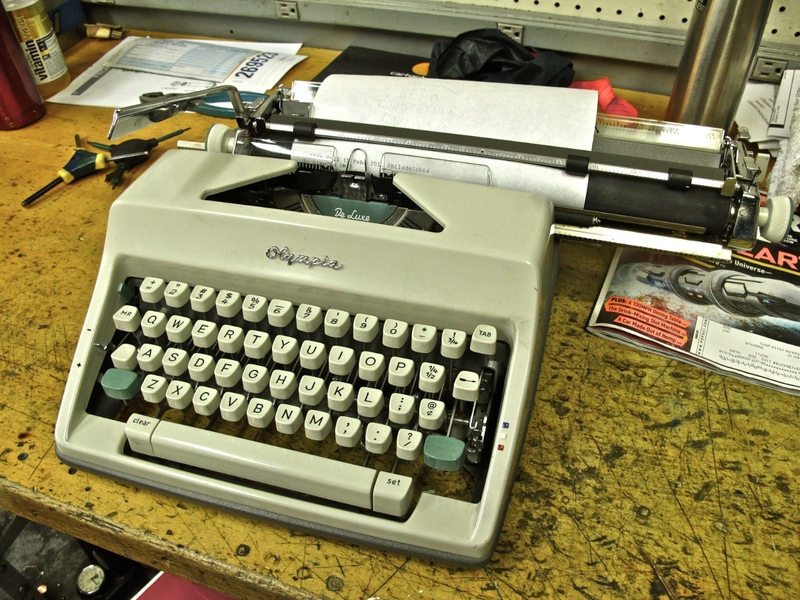 This SM 9 has small type; it had a big price–got it from Mr. Typewriter, fully gone over. It does type beautifully. Perhaps the machine to tackle that 50k novel affair in November? 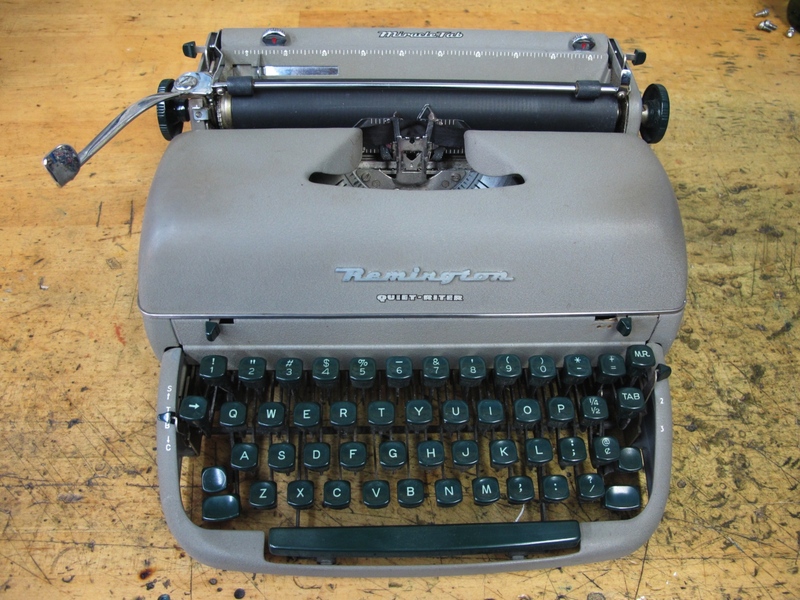 Okay, a Remington Quiet-Riter which came just after the Type-IN…. needs a little tuning, but I think it’s going to become somebody else’s nice machine very soon. It’s not Rite for it to sit around unclacked. That’s too Quiet. Er, yes, If I like something, sometimes I do go overboard, as though they might go out of production; except these SM 9s already did. Not to worry, this one’s been sold to our mechanic Tom. 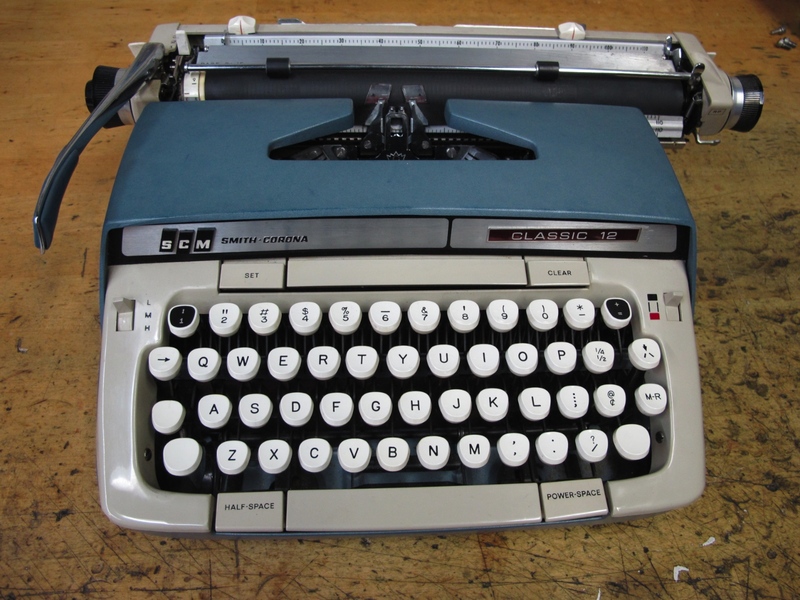 SMITH-CORONA Classic 12… a nice machine. A fellow brought it by, a friend of his mom’s left it at their house decades ago when she moved to the West Coast. It has Power Space and those interchangeable key tops. This is another typewriter that I like, but that will be moving on; I can just feel it’s best to be on show in someone’s writing room. Olympia SF Cursive. 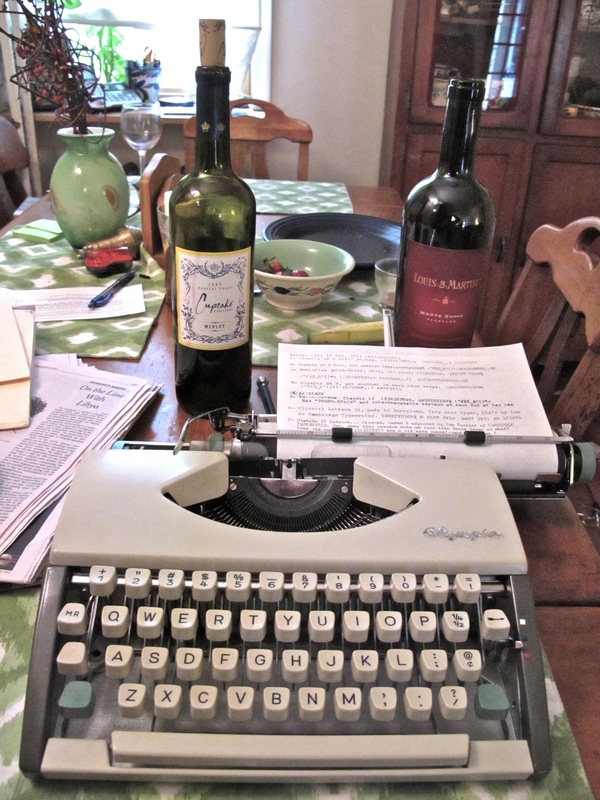 Oh, man, one suave typewriter that you have to put some nice bottles of wine behind before taking the picture. Bought cheap on eBay, it was shipped with like, one packing peanut and bashed up. 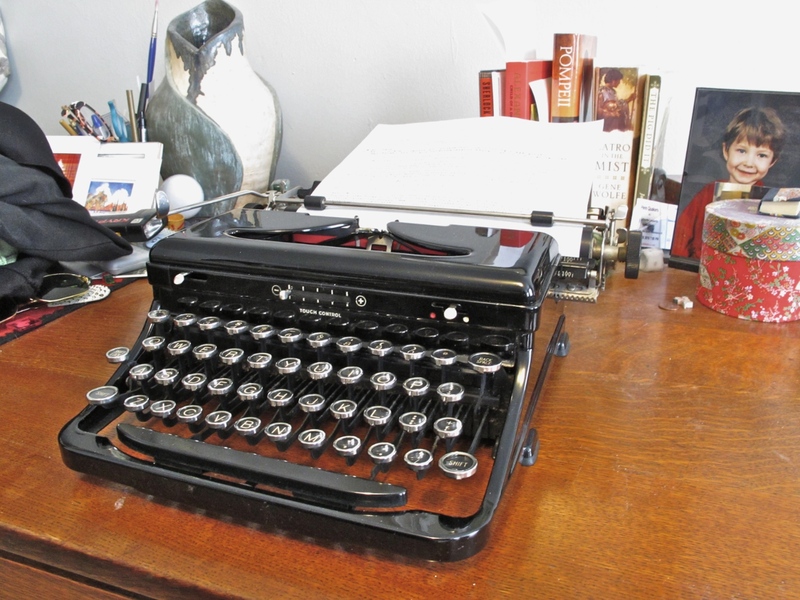 Nursed back to health by Cambridge Typewriter–getting monotonous, eh? Adwoa’s cursives led me to seek this one out. Some day will write a play where one character speaks in fluent Cursive. 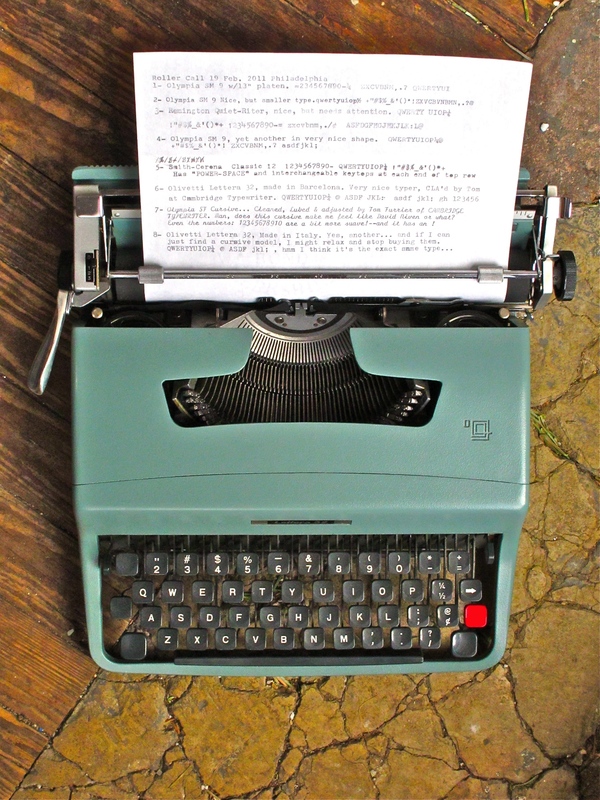 OLIVETTI Lettera 32 — This one’s from home base–Italy. It stays at home, mostly, while the BCN model is at the bike shop. If I find one in cursive, I will stop buying them–maybe. 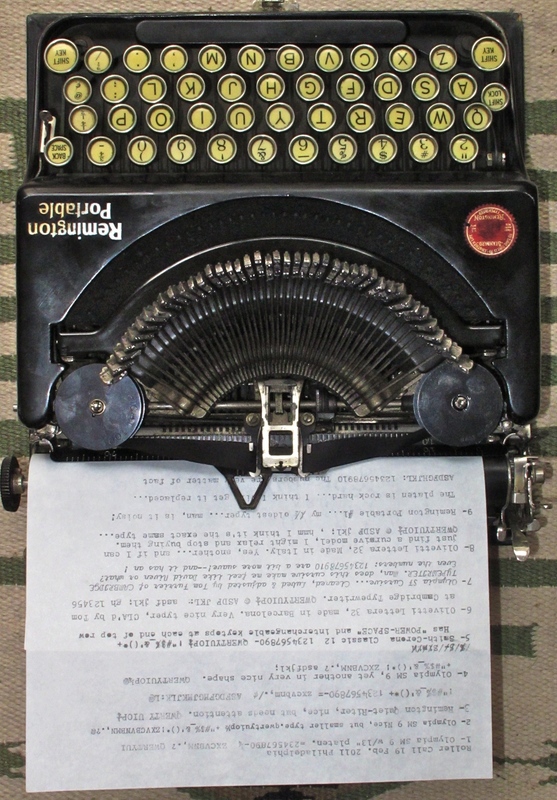 REMINGTON PORTABLE #1. “If you like, I can just cut off the keys and send them to you.” Er, no, that won’t be necessary. (you murderer you) Thank you I’ll take the whole thing. someday to be replaced. Sorry for the upside down, but was struck by the idea of the words sheltering ‘neath that arch of typebars. ROYAL Multi-Touch. Mr. Matt Cidoni brought this to the first Type-IN, determined to get my Hermes Rocket. He did, and we both think we got over. This machine has an almost sinister gloss to it. It also has the smallest typeface of any of the machines I own. Has to be typed on in a clean, well-lighted place. Smokie the cat is certain that I will take this SM 9 back downstairs shortly so that she can stretch out properly. This one is for home, the other two are at the bike shop. That’s reasonable, don’t you think? handsome machine in the entire fleet. I agree that this is too many typers and will have reports when they are placed in new homes. I am hoping you might possibly be able to help me. 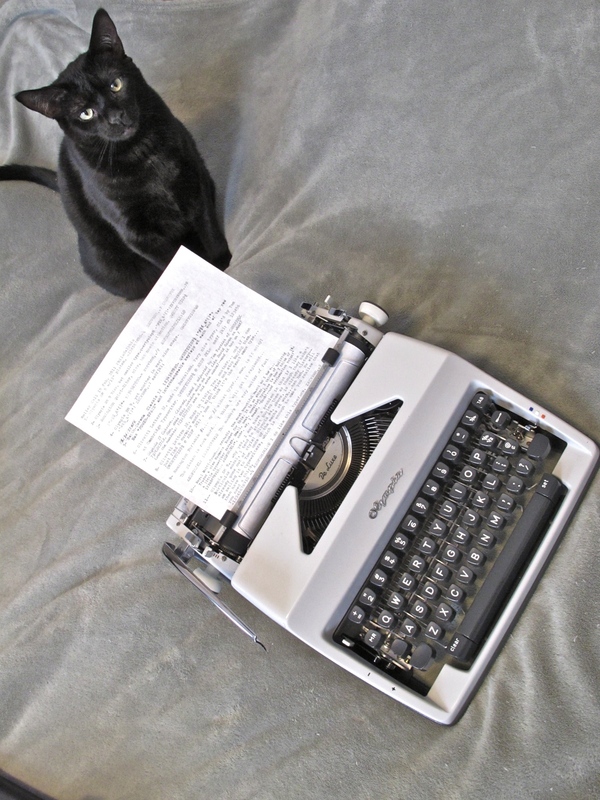 I am looking to buy my boyfriend a typewriter for Christmas, but I’m not sure what kind to get. Do you have any suggestions or know of a place to buy one in the Philadelphia area? 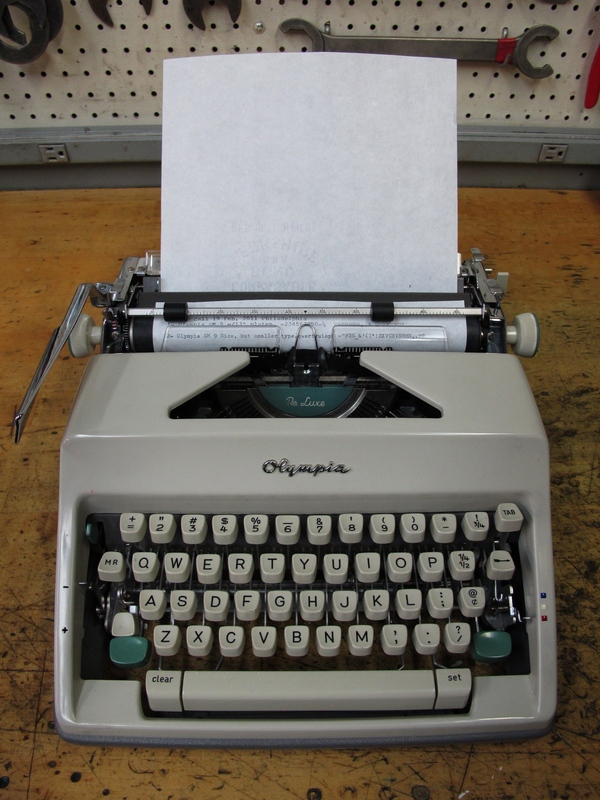 I have a few beautiful typewriters that you can buy for your boyfriend starting at $20 and going up to $100. 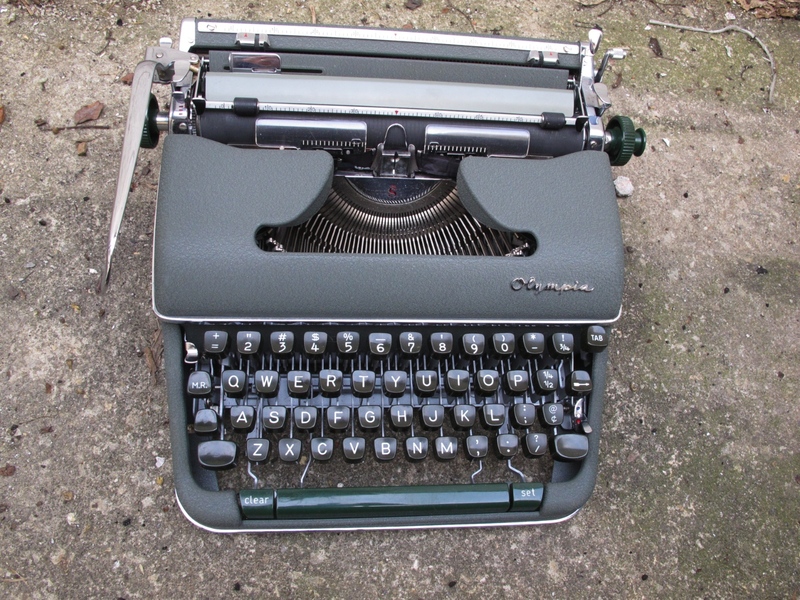 Please visit my website: http://www.typewriters101.yolasite.com and click on the “Typewriters For Sale” page and you can browse through what I have. Hello, this is Yancy Smith. You met me yesterday at the type-in, I was just touching base to let you know that I will send you a probe packet for the study in the next few weeks. Just so you don’t forget my e-mail is smity701@newschool.edu, thank you, Yancy. It’s an SM-4, isn’t it, with the tab keys flanking the spacebar? They’re both such clean, elegant machines. Hmm, actually I think it might be an SM-8… believe the SM-4s, were the older crinkle finish machines. This is cribbing from the Typewriter Database, of course. I am not an authority of any kind, disavow all knowledge, take with a block of salt, etc. etc.! 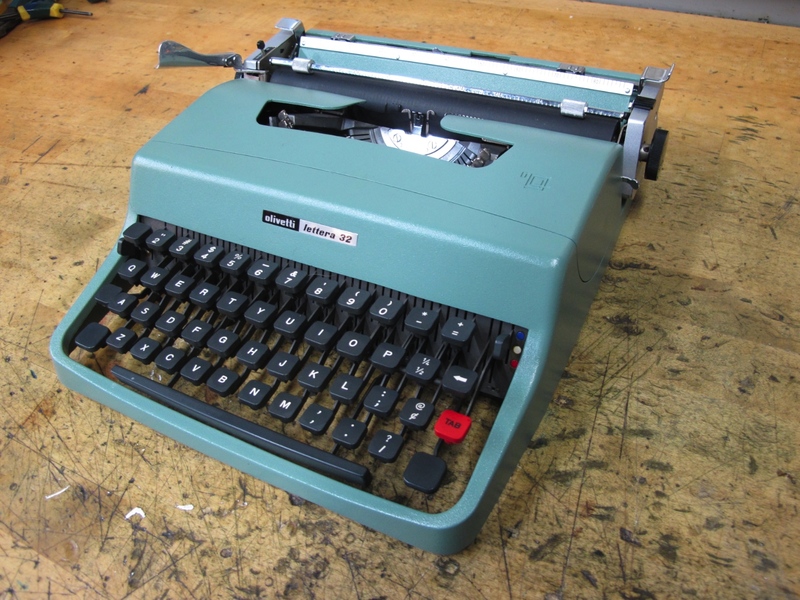 I have an olivetti lettera 32 cursive font made in Barcelona that I am trying to sell. Still trying to find one? Craigslist hasn’t done me any good thus far. Really great to see another typewriter enthusiast in the world.